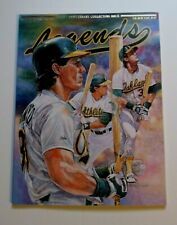 JOSE CANSECO ON COVER - HOBBY EDITION #25 VOL. MAGAZINE IS IN EXCELLENT CONDITION. THIRD ANNIVERSARY EDITION. • This item will ship USPS First Class Mail the same or next day excluding Sundays, and Holidays. • This item will ship to confirmed PayPal address only. • This item comes from a Smoke-Free home. • Feel free to message me if you have any questions before purchasing. • Thanks for looking! • Check out my 100% Positive Feedback! WITH MUHAMMAD ALI ON THE COVER. MAGAZINE IS IN EXCELLENT CONDITION, STILL SEALED IN FACTORY WRAP. MAGAZINE INCLUDES 2 SHEETS OF 9 CARDS EACH. TIGER WOODS ON COVER - HOBBY EDITION #78 VOL. 9 #4 -RARE. MAGAZINE IS IN EXCELLENT CONDITION. THIS COPY IS A PRODUCTION ERROR FROM THE FACTORY. MAGAZINE IS IN EXCELLENT CONDITION - SEALED. JOHN ELWAY ON THE COVER. MAGAZINE IS IN EXCELLENT CONDITION, STILL SEALED IN FACTORY WRAP. MAGAZINE INCLUDES A SHEET OF CARDS. IT IS THE HOBBY EDITION #62. MAGAZINE IS IN EXCELLENT CONDITION. Legends Sports Magazine Nov/Dec 1991 New with foil insert cards + Post cards. This item is in NRMNT/MNT condition. Al & Kate Duncan. BRETT FAVRE ON THE COVER. MAGAZINE IS IN EXCELLENT CONDITION, STILL SEALED IN FACTORY WRAP. LIMITED EDITION 2000. IT IS VOL. 6 NO. 5 PUBLISHED IN SEP/OCT 1993. IT IS HOBBY COVER #51. MAGAZINE AND CARDS INSIDE ARE IN EXCELLENT CONDITION. BRAND NEW, NO MARKINGS, FOLDS, TEARS OR CUTOUTS. 1991 Legends Magazine #28 Ken Griffey Jr. PSA8 pop 1 only 8 higher! WITH ICHIRO SUZUKI ON THE COVER. MAGAZINE IS IN EXCELLENT CONDITION, STILL SEALED IN FACTORY WRAP. MAGAZINE INCLUDES A SHEET OF CARDS. RICHARD PETTY ON THE COVER. MAGAZINE IS IN EXCELLENT CONDITION, STILL SEALED IN FACTORY WRAP. LIMITED EDITION 2500. Great item to get signed by Mike. MAGAZINE IS IN EXCELLENT CONDITION, STILL SEALED IN FACTORY WRAP. MAGAZINE INCLUDES A SHEET OF CARDS. Included are: 9 red foil border cards. JOHNNY BENCH ON THE COVER. MAGAZINE IS IN EXCELLENT CONDITION, STILL SEALED IN FACTORY WRAP. MAGAZINE INCLUDES A SHEET OF CARDS.